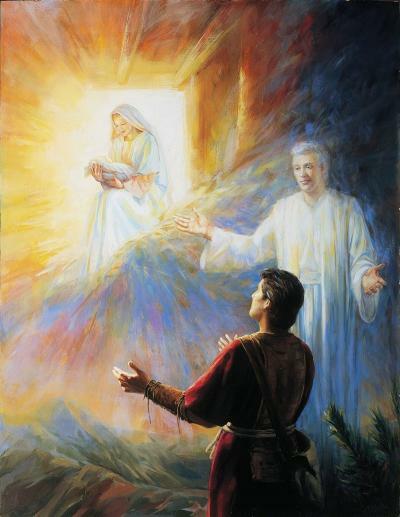 Lehi and his son Nephi both experienced profound visions in the opening chapters of the Book of Mormon (1 Nephi 8, 11–14).1 A characteristic of both visions was that Lehi and Nephi were guided by angelic escorts during these experiences. Lehi opened the account of his vision by describing “a man . . . dressed in a white robe” who came and “stood before” him (1 Nephi 8:5). This man “spake unto” Lehi and “bade [Lehi] follow him” (v. 6). Lehi obligingly “followed him,” and quickly discovered that he had been led into “a dark and dreary waste” (v. 7). After this Lehi prayed to the Lord for deliverance and was answered with his famous vision of the tree of life. 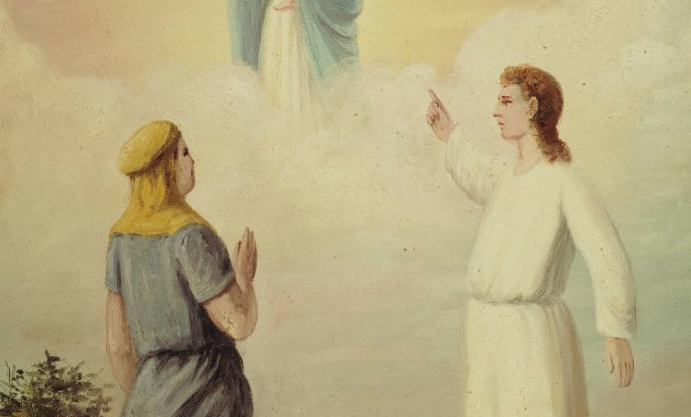 “Nephi’s Vision of the Virgin Mary” by Judith A. Mehr. 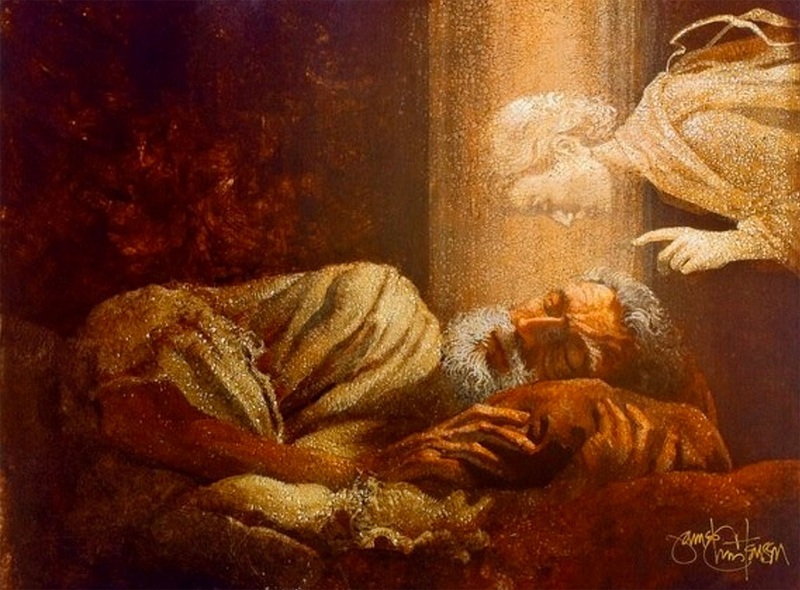 Whatever the case, the Spirit of the Lord soon departed from Nephi and was replaced by an unnamed “angel” who continued the vision (1 Nephi 11:12–14).6 This angel, also called the “angel of the Lord” (1 Nephi 11:34–36; 13:24, 34; 14:29), accompanied Nephi for the remainder of his vision, directing his attention towards crucial historical scenes and asking questions to draw out Nephi’s understanding of what he was viewing.7 At the end of the account of his vision, Nephi informed his readers that the angel was with him at every step, ensuring Nephi mentally perceived and spiritually internalized what he was seeing. “I bear record that I saw the things which my father saw,” Nephi testified, “and the angel of the Lord did make them known unto me” (1 Nephi 14:29). One feature common to apocalypses, both Jewish and Christian, is the presence of a heavenly being who guides the recipient of a revelation through a visionary experience and interprets or clarifies what is being revealed.11 “In [apocalyptic texts], a human prophet sees a highly symbolic and complex vision that, in many cases, draws on elaborate mythological imagery. The nature of the vision is such that the prophet is incapable of understanding its meaning apart from interpretation by a heavenly being.”12 Thus, angelic escorts appear in the visions of Lehi, Nephi, and their contemporaries because in those days the subjects of these revelations were not already familiar and self-evidently recognized even by the prophet, as they are understood more readily today. “Lehi’s Dream” by James C. Christensen. Thus, angels or heavenly guides are a common element in apocalyptic visions, especially in intertestamental Jewish texts. There “the form of the apocalypses involves a narrative framework that describes the manner of revelation,” which may involve “visions and otherworldly journeys, supplemented by discourse or dialogue and occasionally by a heavenly book.”15 Such discourse and dialogue between the prophet and his angelic guide is precisely what readers encounter in the early visions of Lehi and Nephi, along with the heavenly book motif, reinforcing the appropriateness of classifying their visions as apocalyptic.16 These elements are found in ancient prophetic literature in all of these cases because their presence helped audiences in those days to understand and accept the messages being conveyed. On a more individual level, recognizing the visions of Lehi and Nephi as apocalypses invites modern readers to orient themselves personally into the grand historical and symbolic scheme revealed in these passages. As Elder Boyd K. Packer taught, “You may think that Lehi’s dream or vision has no special meaning for you, but it does. You are in it; all of us are in it.”19 Just as the heavenly messengers guided them through the visions which reveal and clarify plain and precious truths, Lehi and Nephi become escorts who beckon their latter-day readers to “press forward through the mists of darkness” until they reach the tree of life and partake of its exquisite white fruit (1 Nephi 8:11, 24). Robert L. Millet, “Another Testament of Jesus Christ,” in First Nephi, The Doctrinal Foundation, Book of Mormon Symposium Series, Volume 2, ed. Monte S. Nyman and Charles D. Tate Jr. (Provo, UT: Religious Studies Center, Brigham Young University, 1988), 161–176.